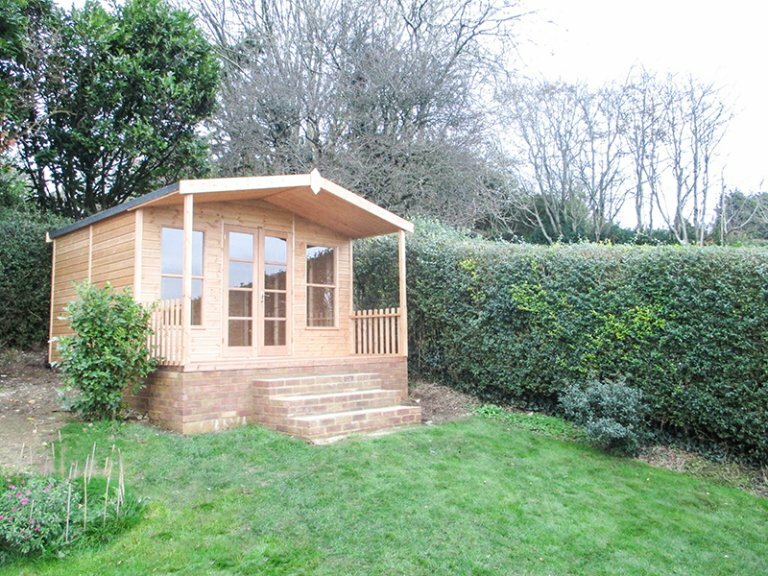 One of our Morston Summerhouses was recently installed in a customer’s garden in Brighton, East Sussex. This lovely setting on a raised platform presumably affords panoramic views over the rolling fields and out onto the English Channel beyond, the perfect place to sit out on the veranda. The summerhouse measures 3.6 x 4.2m and is clad in our high-quality FSC® certified timber in the standard colour of Light Oak which not only displays the grain in the natural wood but also acts as a preservative. The shiplap cladding gives a chalet-style look that will remain relevant throughout the seasons. There is also the optional extra of selecting one of our many Valtti Paint Colours for the exterior which can be seen here. The apex roof comes standard in heat-bonded, heavy-duty felt with further options of tiled roofs also available. The double doors provide access and light into the building and have polished brass door furniture, which is also available in chrome. 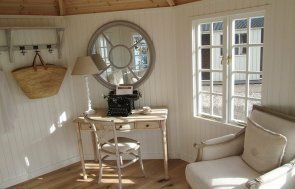 The Morston Summerhouse as standard is not lined or insulated, but for those who wish to be able to use their buildings all year round, full insulation is available as an optional extra. 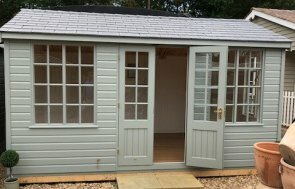 To view our full range of Summerhouses, please click here. If you would like more information on any of our products, don’t hesitate to Get in Touch or even pay us a visit at one of our UK show sites.